I can ferment sauerkraut with my eyes closed, but I have had a hard time with fermented pickles in the past (didn’t turn out well) … I just keep trying. Instead of using whole pickling cucumbers I decided to try my luck and go about it differently, so I sliced the cucumbers this time. I did not plant cucumbers this year. I talked to my neighbor/friend about growing cucumbers this season because I grow most of my peppers and the zucchini in their garden and he agreed that this year we could share the cucumbers too. He has been growing Armenian cucumbers (actually in the melon family) for the past few years and he always has way more then he needs. 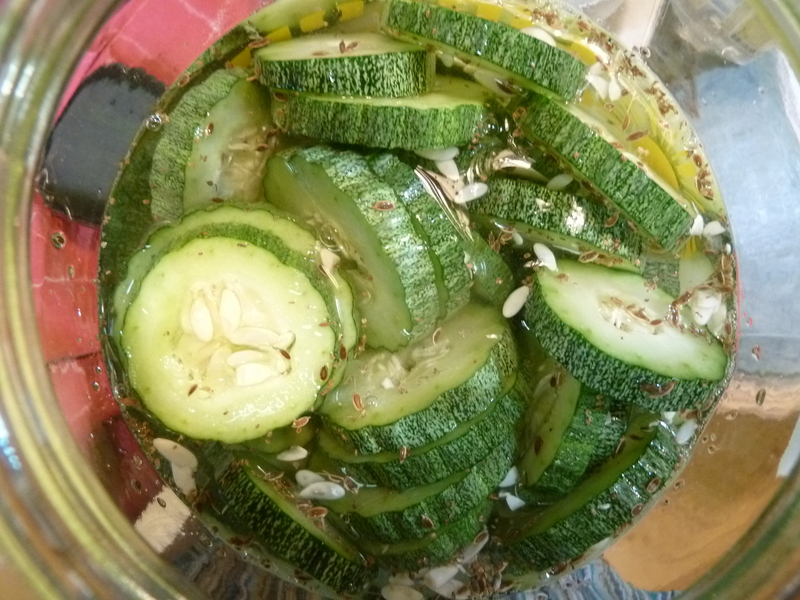 The armenian cukes are nice, but I want to grown pickling cucumbers again. 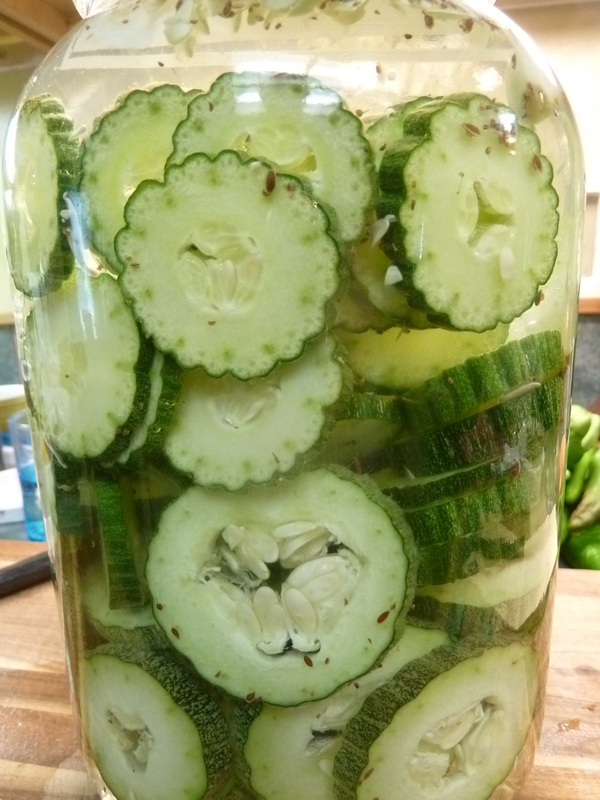 Back to my experiment… I sliced the cucumbers and put them in a glass gallon jar. I added the herbs and spices that I wanted (dill seed, celery seed, and garlic) and poured the brine over the top. The brine was 1 1/2 T to 4 cups water. 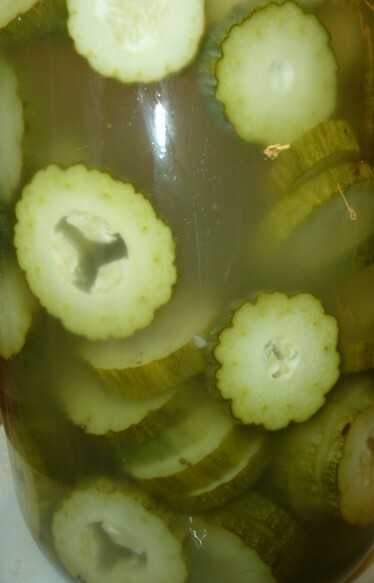 The big thing with fermenting is that you need to keep the vegetable below the liquid to avoid bad bacteria from growing. I could not find a jar that was big enough, yet small enough to fit down through the opening of the gallon jar. I had to resort to using a gallon zip-top bag with a little water in it, then I sunk a pint jar into the bag and filled the jar with some water also. I am not a big fan of plastic, but it worked. I will be either looking for the perfect jar to weigh things down or a different glass jar. As I type this and thing about it – I really could have used my fermenting crock. The past issues that I had when fermenting pickles in the fermenting crock that I have is the weights. The whole cucumbers are so buoyant and the ceramic weights are a bit on the smaller side that the cucumbers can sneak up on the edges. Then they are exposed to air and things go quite wrong in a hurry. It worked! I have successfully fermented cucumber slices (three times now!) Boy are they good! We now have a ton of them in the refrigerator and we are munching our way through them fast. I have shared several quarts with our neighbor/friend. Anyone else out there fermenting things? We have a few neighbors and friends that like to garden. 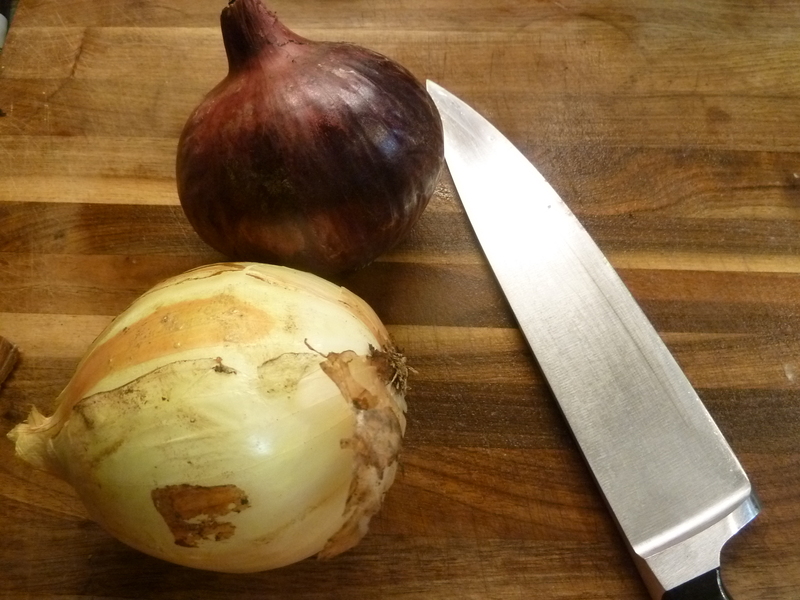 One of them brought us some fresh onions the other day. They were beautiful. A wonderful treat. What treat are you enjoying from your garden or local farmer’s market? 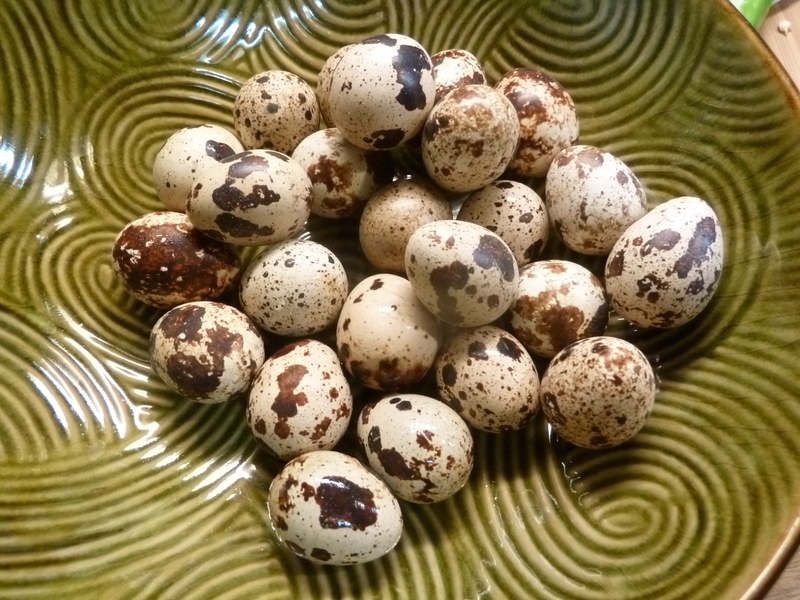 On Sunday I posted a photo of the quail eggs that I brought home from a recent barter. They are so tiny and so beautiful. 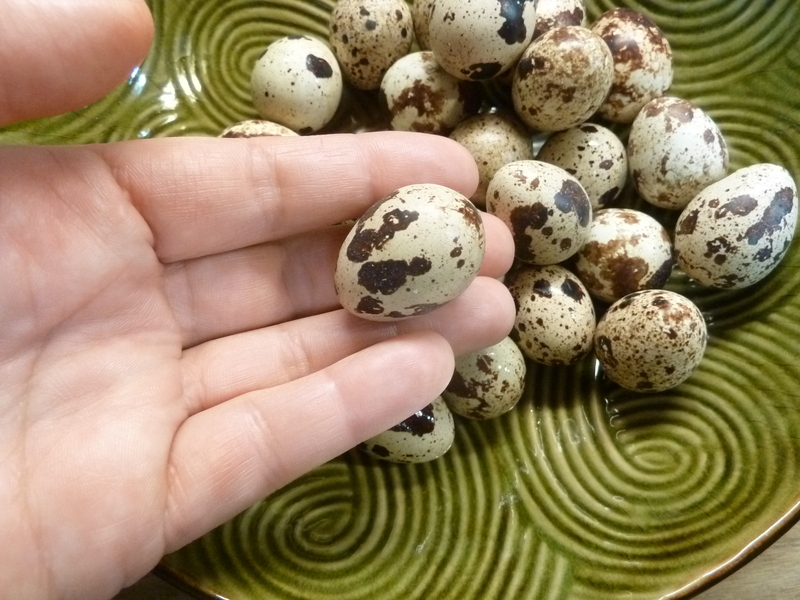 Each quail has its own distinct patter on the eggs that she lays – like a fingerprint. That is amazing, isn’t it?! Imagine my surprise when I started cracking them open and found some that were colored inside – a beautiful range of light blue/aqua. Nature is amazing! I had no idea how many quail eggs made an omelet, so my plan was to just keep adding eggs until it looked like the amount of two chicken eggs. Well, I got a little carried away. 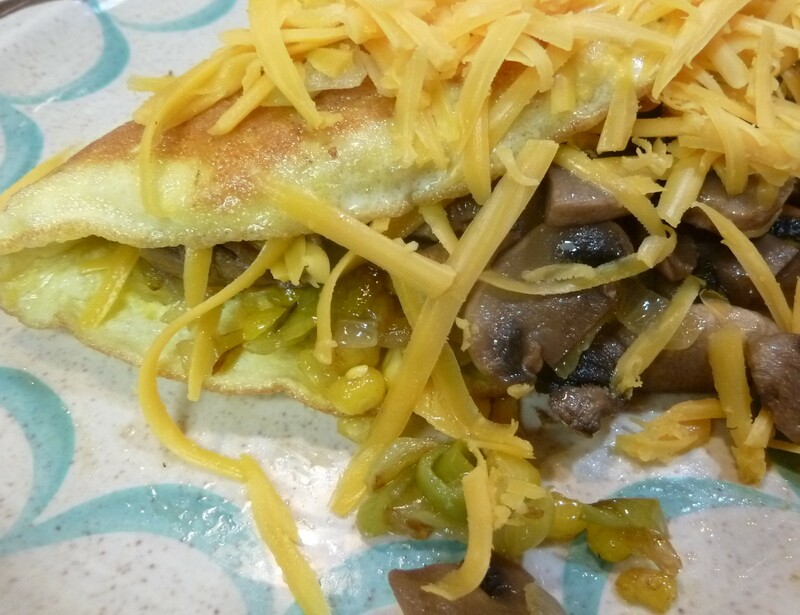 The first omelet had 18 eggs in it. That was just too many. We are eating a lot of things out of the garden right now. Peppers from the garden, along with beautiful onions from my neighbor, and local mushrooms from Kitchen Pride. As I think back to the barter and all the wonderful things that I come home with, I smile when I think of the variety of eggs: Quail, Chicken, Duck, Turkey. All the eggs are beautiful. What kind of eggs are in your refrigerator? 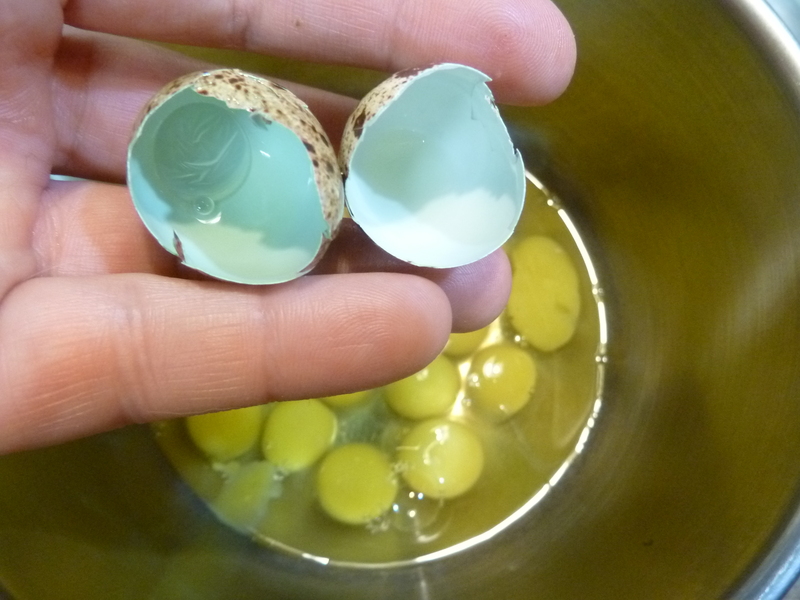 Quail egg omelet coming right up! The wrens are at it again. Such persistent nesters. Motivated. Creative. Some of you might remember a few wren posts that I did a while back. You can read about there here and here. I don’t know that I can call this a problem, maybe it is more like a situation. Brought on be me. We leave the back screen porch doors propped open for the cats to come and go. See what I mean, all brought on my me. This time they have abandoned the idea of nesting in potted plants out on the screen porch. They really put some thought into this one. They know I will kick them out of the potted plants. The funny thing is that would not have been a big deal at this time. All the plants that are left on the porch are all dead and since I still haven’t moved many of them outside that would have been a safe place to nest.No, this time they picked a baseball hat that is hanging on a hat/coat rack on the screen porch. I use it for things like my headlamp for grilling, a visor I wear outside when it is sunny, the ear muffs that I wear for hearing protection when I mow the lawn or use the chain saw, a rain jacket to use when I go outside to manage the rainwater tanks when it is raining, a huge bundle of drying cilantro including coriander seeds, and a nice camouflage baseball hat that clearly didn’t get worn enough or there would be no nest built in it. It really is a perfect spot. She and her mate have built an impressive little nest there using the inside of the ball hat and the arm of the hat rack that comes right up under it. The nesting female has a clear view to both outside doors to see who is coming and going. Ingenuity and good construction all that way. I was telling a friend about the unique nesting spot and she requested a photo. I wasn’t sure if the nest was in use, so I inched my way closer to it, got the camera up there for a good shot and out shoots mama-wren. Man, she was really hidden in there. Now that she was off the nest, I turned on the flash and could clearly see the eggs. Yup. She is staying, I told it was alright. The next interesting phase of this plan will be when the chicks are starting to fall out of the nest, how they will get outside! I guess I need to clear the way below, after all, I think the coriander seeds are dry by now! Another thing I need to think about is the cats. These wrens are really motivated. Have you have any nesting birds in unique places? 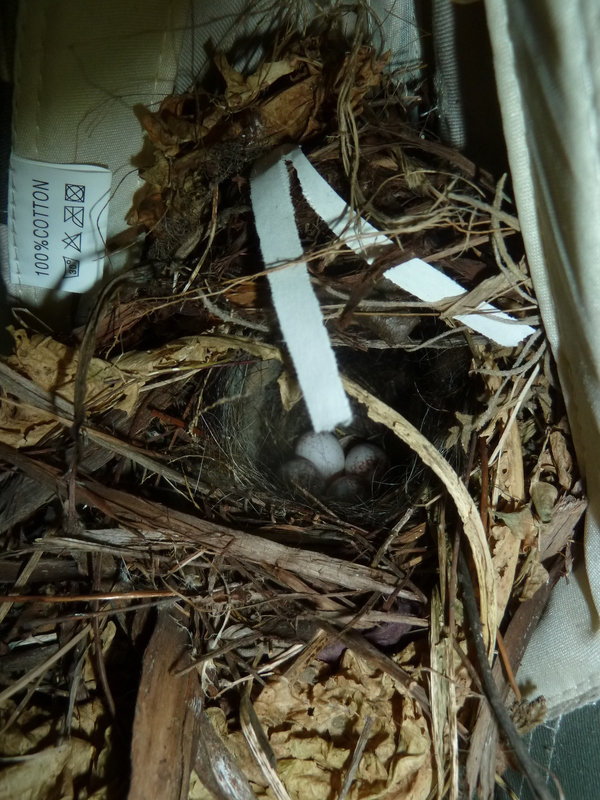 UPDATE: This morning (14 July) when I headed out the back door I head tiny baby birds talking. The wren eggs have hatched. Without getting too close, I can see 4 tiny heads sticking up and screaming for food. 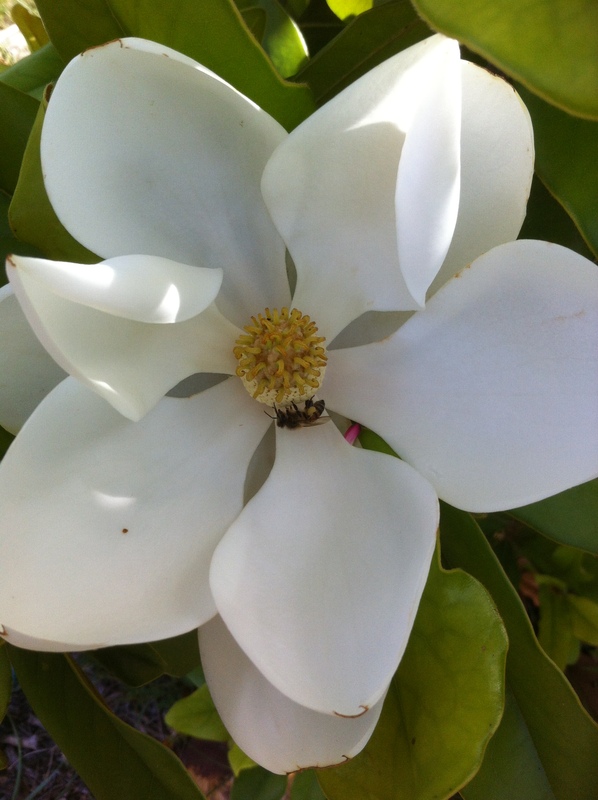 Enjoyed watching this happy bee collect pollen on the beautiful magnolia blooming in our backyard. So happy to see bees in the back yard. So happy to see his back legs covered in pollen. I mentioned in my last post (about the chard stalks) that I have worked to shade parts of the vegetable garden this summer. 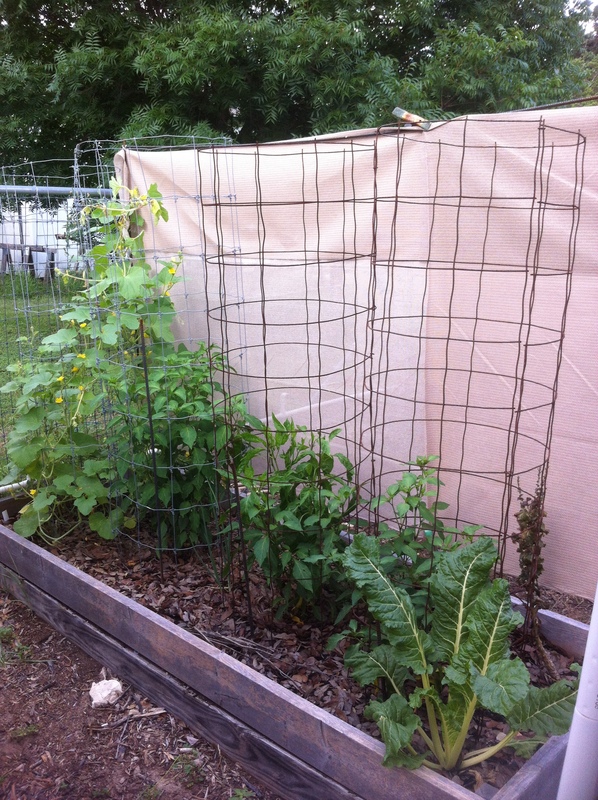 Creating shade for the garden has been on that endless list of mine for the past 2-3 years. Not only are our South Texas summers hot, but I have full open exposure to the garden to the west, so everything is in the garden roasting until the sun goes down and that is really hard on the plants. There is a magnolia tree that is growing on the west side of the garden. It was planted before we moved in, and it is growing well, but it will be many, many years before it is tall enough to provide any afternoon shade for the garden.